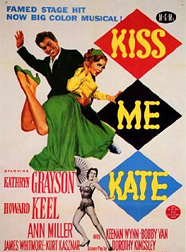 HARLEQUIN was inspired by this poster from the 1953 film Kiss Me Kate (detail at left). It has a jolly jester’s hat feel and also resembles turned wooden spindles. As seen in use in these “personalized totes for the eco-check girl,” from Label Me Lisa.